As we mentioned in September, the Star Wars Prestige Stamp Book will be issued on 14 December to coincide with the cinema release of the latest film in the series. the PSB will contain 4 x 1st class, 2 x 2nd class and 2 x £1.40 Machin definitives which should be coded M17L MPIL. This will give us three new stamps in the pane of 8. 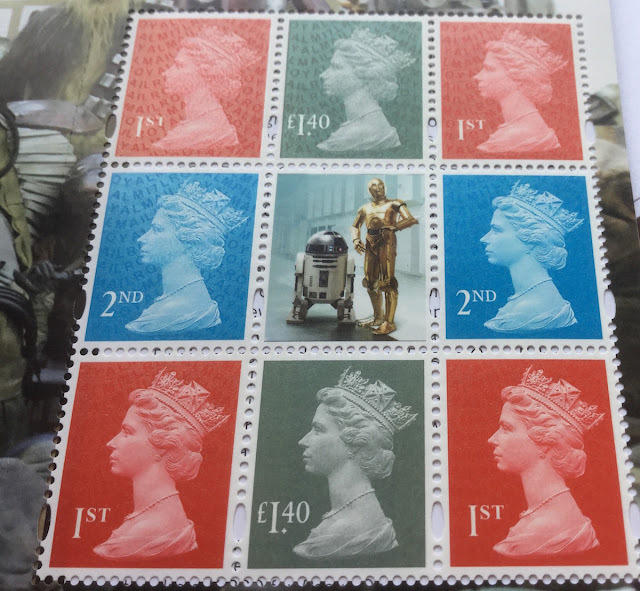 I had overlooked, of course, that the Machin PSB also contained a gummed 1st class stamp coded MPIL M17L, so maybe there would only be two new stamps in the Star Wars pane. Like the 1st class stamp in this year's Windsor Catle PSB we would expect all these to be the new darker red, also known as deep scarlet. But the stamp in the Machin pane was lighter - presumably the original red colour as shown on the miniature sheet in the same issue, although some people thought that it was dark enough to qualify as the new colour. Who knows what the ink mix was that time? So what colour is the one in the Star Wars book? - Answer: Lighter than both the others!! The picture shows: left, Windsor Castle M16L; upper right, the Star Wars M17L; lower right, the Machin Anniversary M17L. 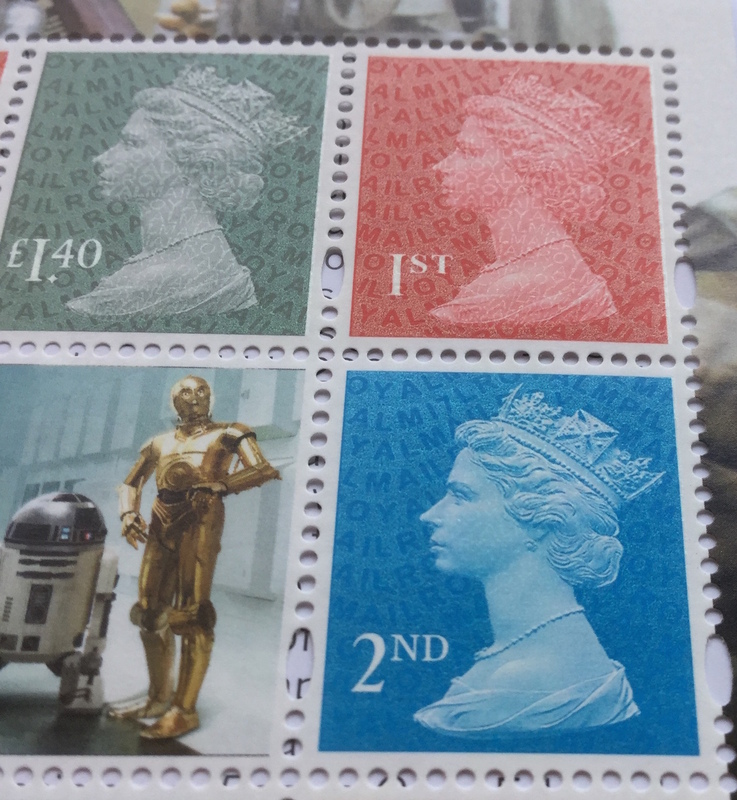 In my view, the latest stamp cannot possibly be described as deep scarlet, it certainly isn't the same colour as the Windsor Castle one - arguably there's even less black in the mix than in the 2015 Star Wars stamp or even the 2013 Football Heroes PSB! UPDATE 15 January 2018. 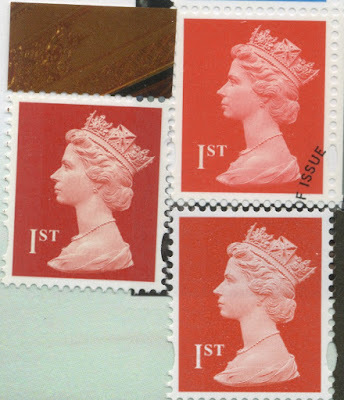 Readers have reminded me that the stamp in the Machin Anniversary PSB was printed in gravure, so different to the others in any case. For the present SG have listed the pane as U3014ac containing U3016b, the darker colour. This may well change. The lack of colour consistency extends to the new £1.40 stamp in the new book as well, the self-adhesive counter sheet stamp shown below on the left. Maybe it doesn't matter because they are not supposed to be used for postage, but colour matching seems to have gone by the board. 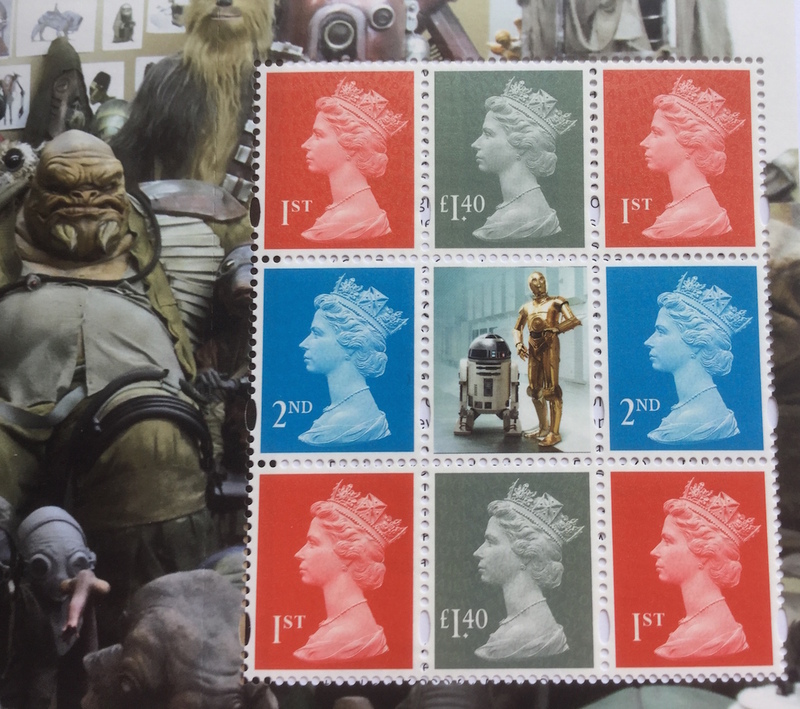 For the record, here are pictures of the whole pane, and close-up of the three new stamps which we shall offer in our shop at the appropriate time. 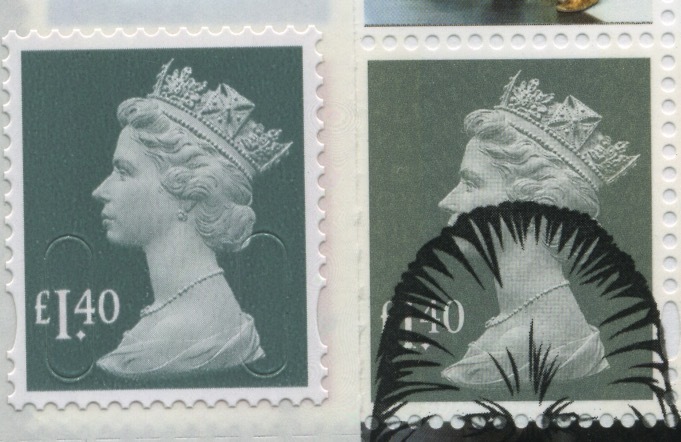 The Norvic Security Stamp Checklist will be updated when I have finished dealing with the latest Post and Go stamps, and can get my head round these in the PSB. Your thoughts, as always, are welcome!